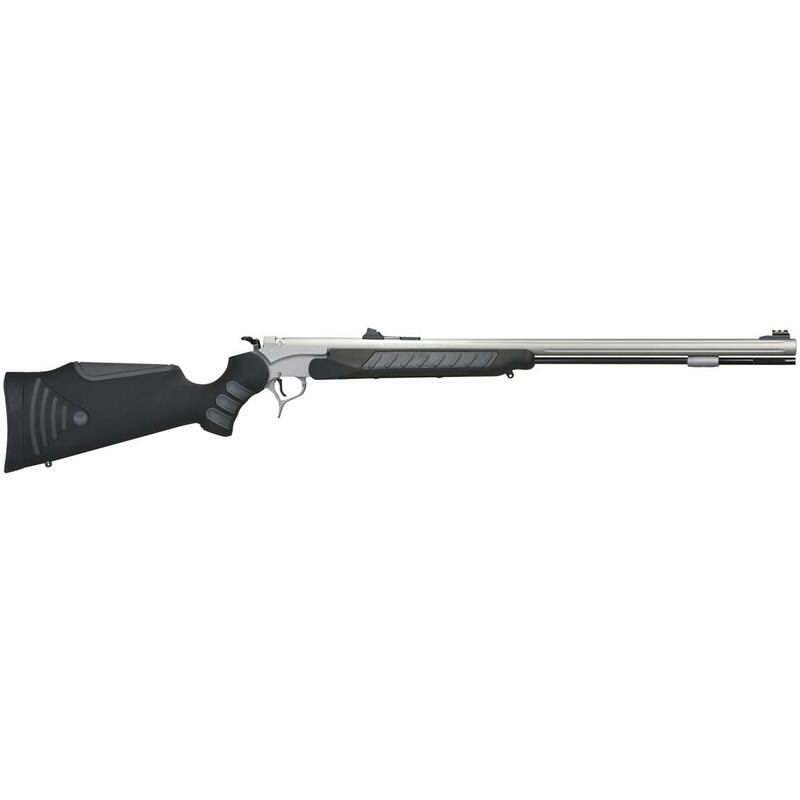 Thompson / CenterTM Pro HunterTM FX Muzzleloader. A serious shooting advantage. If looks alone could kill, this fixed-barrel Black Powder Rifle would drop a 10-pointer from 100 yards out. It ain't Grandad's rifle, that's for sure. And it doesn't shoot like it either. Read on to find out what sets the Pro Hunter FX Muzzleloader apart. An advanced, tough-as-nails, corrosion-protection system making the barrel and other critical metal parts nearly impervious to rust. Tested to be 50X more corrosion resistant than stainless steel alone. Recoil reduction technology that features a soft touch comb that takes the bite out of muzzle rise, while the smooth surface finish allows the cheek to slide forward during firing. Over molded finger grooves in the stock and rubber grill pads in the forend give you firm control of the rifle in both wet and dry conditions. Sling swivel studs are molded into the stock and forend to eliminate the possibility of pulling out. A rotating hammer design that can be off-set to allow easy access to the hammer spur. The hammer is keyed to allow the spur to be placed in the center, left hand or right hand positions. the latest in hand-removable, threaded breech plug technology. Unlike competitors' threaded breech plugs, the Speed Breech 3's triple lead thread design gives it more area between the threads to help prevent breech plug seizing from powder corrosion. The triple lead thread design equates to easier removal with fewer turns than conventional plugs. Removal and cleaning just got easier with Thompson / Center's new Speed Breech 3! Quick Load Accurizor. Allows you to quickly and easily load your rifle by incorporating a false muzzle design into the barrel of the rifle. Accuracy is enhanced through the QLA design by aligning the projectile with the rifling. The projectile is supported while you're loading the rifle to assure the projectile is started exactly perpendicular with the rifling. The secret behind QLA is only removing the rifling (.0005 of material) while maintaining the groove depth of the bore. Other "muzzle guiding systems" only aid in starting your projectile; they do not work as a true false muzzle and cannot deliver the enhanced accuracy of the QLA design. 42 1/2" overall 7 lbs. Thompson / Center Pro Hunter FX Muzzleloader, Black Stock is rated 4.8 out of 5 by 4. Rated 5 out of 5 by Diamonded from T/C still best ever This is a great product that you will be proud to own. I love it. CVA's flagship Muzzleloader just got even better.